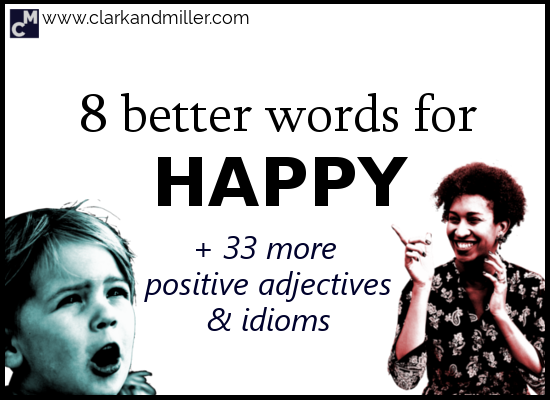 Today, you’re going to learn 41 positive emotion adjectives and idioms to describe happy emotions. For more positive English words, check out 59 Positive Personality Adjectives! Today, I’m going to show you how to stop repeating yourself when you’re talking about positive feelings. Pleased — This word means between “happy” and “satisfied.” Very often, you’re pleased with a particular thing. Like your exam results. Or the hippo dancing. Cheerful — This is when someone is visibly happy. They walk into the room, and you can see it in the way they walk, what they say and the massive smile on their face. Exuberant — This is like cheerful — but even stronger. Euphoric — When you’re intensely happy. This is when all you can feel is your own happiness. It really is a very strong feeling. Merry — This is a little like cheerful. Usually, when you’re feeling merry, you might be in quite a playful mood as well. We often associate this with how you feel after a couple of glasses of wine. Glad — “Glad” is similar to “pleased.” Usually, you’re glad about something in particular. Like the wonderful news. Or the football result. You may have noticed that most of these refer to being somewhere high up. Which makes sense, right? The Larry idiom? Well, that doesn’t make sense. I mean — who’s Larry, and why’s he so happy? At the top: you’ve just won the lottery, and your doctor has told you that you have a genetic condition that means you can NEVER put on weight. At the bottom: you’re at the supermarket, and you’ve found a till with no queue. Take a look at this picture. How would you describe her? Charged — Imagine you’re about to do a parachute jump. How do you feel? This is like “excited” but has more adrenaline. More tension. Pumped — “Pumped” is kind of similar to “charged.” You’re excited AND ready for an intense situation, like a dangerous mountain biking trail or a heavy game of kangaroo wrestling. Because some words are just too strong for some situations and others are just too weak, I’m going to add a scale for each word in this lesson. The scale ranges from “going to a new cafe” (not very exciting… but kind of exciting. A bit) to “preparing to fight a massive bear” (so exciting that it’s kind of terrifying). So the “red zone” is something you might want to avoid unless your lifestyle is pretty extreme. Small print: These may vary slightly depending on the situation and who’s talking. Yes! You guessed it! She’s surprised! Amazed — You probably already know this one. It’s like “surprised,” but there’s an air of magic to it. Like that time when you first saw a unicorn. What? You haven’t seen a unicorn yet? Well … you’ll be amazed. Startled — This can be a bit negative sometimes. “Startled” has a feeling of shock and even alarm to it. I always think of that feeling when you’re at home, and you think no one is there. You go to the kitchen for a cup of tea, and you see your flatmate there. You thought she was out, right? How do you feel? Startled! Dumbstruck — Very, very surprised. Maybe so surprised that you can’t speak. Weak surprise is when your friend has a new hat. Strong surprise is when you get home, and your house is suddenly a zebra. OK. How does he feel? How many words can you use? Engrossed — This is basically the same as absorbed. On the edge of your seat — When you’re just really interested in what’s happening. I always imagine sitting in the cinema, so interested in the film I’m watching that I’m literally sitting on the (front) edge of my seat. Weak interest is when your best friend wants to tell you about their job interview. It’s kind of interesting because it’s your friend. Even though the interview itself isn’t interesting. Strong interest is that film. We all have one of those films. It’s that film. Oooh… You’ve got what you want, and it feels good! But how many words can you use to describe it? Fulfilled — That special feeling you get from being satisfied with your life — maybe it’s work; maybe it’s family; maybe it’s helping homeless rabbits. Satiated — We usually use it to describe feeling satisfied after a meal. At the bottom, we have that feeling after a good cup of tea. We all get that feeling sometimes, right? When our feelings and emotions take over. Sometimes, it can feel great, can’t it? Moved — It simply means “emotionally affected.” For example, when we watch a powerful drama, or when someone buys us flowers unexpectedly. Overwhelmed — This is when something gets too much for us. Have you ever suddenly started crying with happiness when you weren’t expecting it? You could say you were overwhelmed with emotion. This can be used for negative situations as well as positive ones. Low-level emotional is when your favourite TV show is doing a double-length episode this week. Oh, yeah. That’s the life. OK. This is the last one. Before you read on … how many words do you know for relaxed? Chilled out — You’re by the pool. You’ve got your favourite cocktail in your hand. There are no kids anywhere. You can hear the waves of the sea hitting the beach nearby. How do feel? Yep. Me too. Soothed — If “calm” means “not angry/stressed,” then “soothed” means “not angry/stressed anymore.” In order to be “soothed,” you need to be angry/stressed first. Then you see the cat video, and you calm down. Tranquil — Remember the feeling you had by the pool? Now be 10 times more relaxed. Now you’re tranquil. Congratulations! Composed — You know that guy who’s always really calm, but not in that pool-side way — more in that focused, dynamic way? You could tell him that there was a bomb in his trousers, and instead of panicking he’d just figure out a way to control the situation. Never panics, never gets emotional … He’s composed. Super relaxed is when you’ve actually just left your body. Mildly relaxed is when you thought you had to wash a few plates. But it looks like someone else has already done it. So now you can talk about your feelings with these positive emotion adjectives. Good work! But I want to make sure you’ve understood these well. So, in the comments below, can you tell me about a time when you felt thrilled, on the edge of your seat or merry. Did you find this useful? Do you know any people (or dolphins) that might also benefit from this? Then BE AWESOME AND SHARE! Spread the knowledge! ⟵Do You Know This Little English Trick to Make People Laugh? Well Gabriel I should say I´m thrilled and certainly in high spirits when I´ve got your post. I loved the explanations of words thousand times given in lists of synonyms that are useless without exploring their shades. The scales are great for that purpose and I had fun with them. Nice post and it must had been hard work, you rock! Great post, Gabriel, thank you again. Wow! What a great article! Not only is it really useful since most people get stuck with the same ones but it was a fun read as well, thank you! I will definitely share ?